My Best Friend Has Paws! Does your best friend have paws? Mine do! Fur babies give us an unconditional friendship, loyalty and love. Best friends have paws too! What is a best friend but someone you trust, confide in, laugh with, goof around with, cry with and celebrate with. Did I forget anything? 🙂 Our furry best friends are the best, paws down! I love stainless steel chain!! 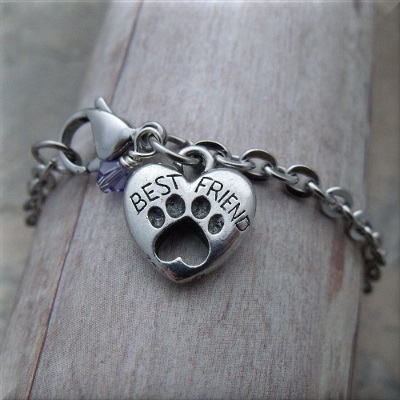 This bracelet has an adorable heart charm with a paw print in it ( super cute ) and it dangles on stainless steel chain with your choice of Austrian Crystal birthstone color. The birthstone can be yours, a friends or best of all, your fur babies! What was my inspiration? My own dogs of course! They were everything to me (and still are). I enjoyed every minute of every day I had with them whether we were playing, training or just chillin’ watching TV. I learned so much about myself from them and I’m so grateful. Even though they aren’t here on earth, their love lives in my heart forever and ever! Is your fur baby your best friend? Comment below! I want to hear how many of you have best friends with paws!